... ... ... (2°) NEO Shu-Lian (born in Singapore in 1923). ... ... born in Singapore in 1930, Teacher, married ONG Swee-Keng. ................ born in Singapore in 1960, Engineer, married TAN Hui-Pheng. ...................................E.1.1.2.1 : Nicholas ONG, born in Singapore in 1993. 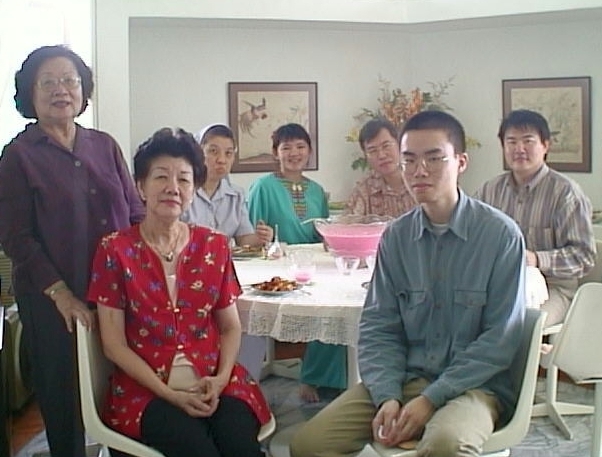 ...................................E.1.1.2.2 : x, born in Singapore in x. ................................................... born in Singapore in 1963. 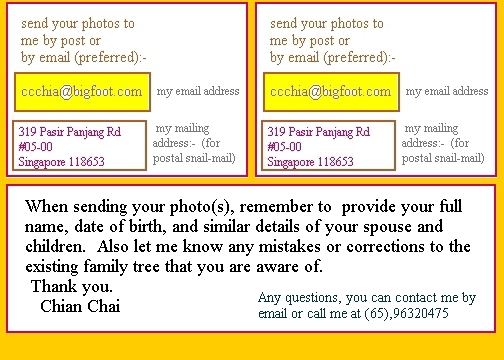 ................................................... born in Singapore in 1965, married Christian ZARN. ................. born in Singapore in 1931, retired. ................. born in Singapore in 1932, Medical Practitioner, married LAM Oi-Weng . 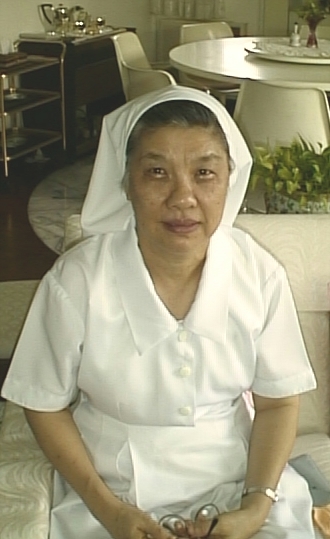 ................. born in Singapore in 1934, Catholic Nun. ................. born in Singapore in 1935. ................. born in Singapore in 1939, Medical Practitioner, married Valerie,GAW Soei-Geok. ................................................... born in UK in 1972. ................................................... born in UK in 1975. ................. born in Singapore in 1950. ................. born in Singapore in 1954, married KOH Chun-Kiat. ................. born in Singapore in 1994. ... born in Singapore in 1908, died in Singapore in 1975, married LEE Chuan-Neo. ................. born in Singapore in 1945. ... born in Singapore, died in PJ Malaysia. ... born in Singapore, died in Singapore in 1923, married CHIA Kim-Yam. ... born in Singapore in 1921, married SEET Kiat-Neo. ... born in Singapore in 1949, died in Singapore in 1966. ... born in Singapore in 1965. ... died in Singapore in 1943. ... born in Singapore in 1905, died in Singapore in 1992, married CHIA Chiow-Lock. 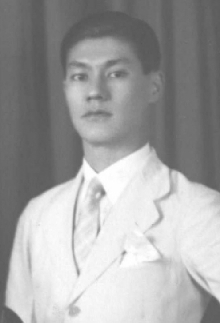 ... born in Singapore in 1927, married SIM Boon-Thong. ... born in Singapore in 1967. 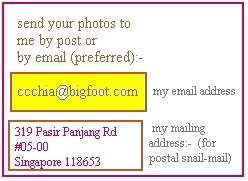 ... born in Singapore, died in Singapore in 1976, married WEE Bit-Chay. ... born in Singapore, died in Singapore in 1981, married ONG Tong-Chuan. ... born in Singapore in 1942, died in 1995, married Leonisa CORDERO . ... born in Singapore in 1970. ... born in Singapore in 1975.